Modular UPS is easy to maintain as only one module can be replaced and reinstalled which is comparatively simpler than traditional UPS system. Modular UPS is used to maintain the optimum efficiency of the system. The modular UPS consists of different modules that combine in series. The modules can be easy replaced upon failure or damage while working. The modular UPS originate with the continuous monitoring system which allows the system to monitor the failure and restore it quickly. The traditional UPS system does not have centralized architecture. However modular UPS has both centralized and decentralized architecture. 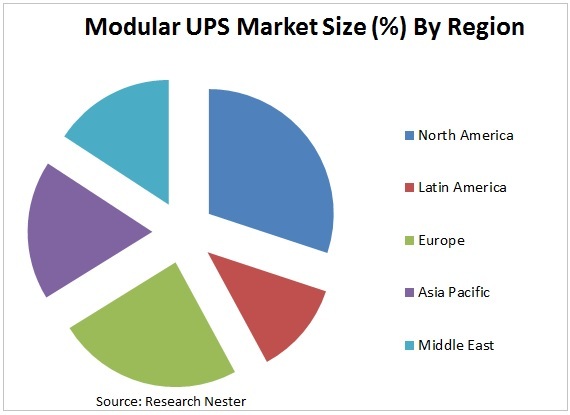 The global modular UPS market is anticipated to expand at a CAGR around 13% during 2018-2027. The global modular UPS market is anticipated to reach around USD 3.9 billion by 2027. The growing demand for the modular UPS is driven by reduced total cost, increasing demand for the colocation facilities and also easy installation of the module.The global modular UPS market can be segmented on the basis of solution, technology type, service and end-user industries. On the basis of solution, it is sub-segmented into 10-100 kVA, 101-250 kVA, 251-500 kVA and 501 kVA and above. 101-250 kVA solution is anticipated to grow at the fastest rate on the account of easy installation, easy maintenance and increasing capacity expansion. On the basis of technology, it is sub-segmented into centralized parallel architecture technology and de-centralized parallel architecture technology. On the basis of service type, it is sub-segmented into professional service and integration service. The integration service is anticipated to be the fastest developing sub-segment on the account of efficient power management system. On the basis of end-user industries, it is sub-segmented into healthcare, manufacturing, banking, transportation, IT & telecom, media and entertainment, retail and energy and utility. The growing number of data center is anticipated to be a major growth driver for the global modular UPS market during the forecast period. The low maintenance cost associated with the modular UPS is anticipated fuel the market for the modular UPS. The enhanced after service associated with modular UPS is also major factor driving the market growth of modular UPS. The efficiency of the modular UPS is high if it is working at its maximum capacity. The increasing awareness regarding the use of the modular UPS among various end-user industries is also major factor supporting the growth of global modular UPS market. However, complex shape and increasing the space and weight of the modular UPS is anticipated to hinder the market growth during the forecast period.